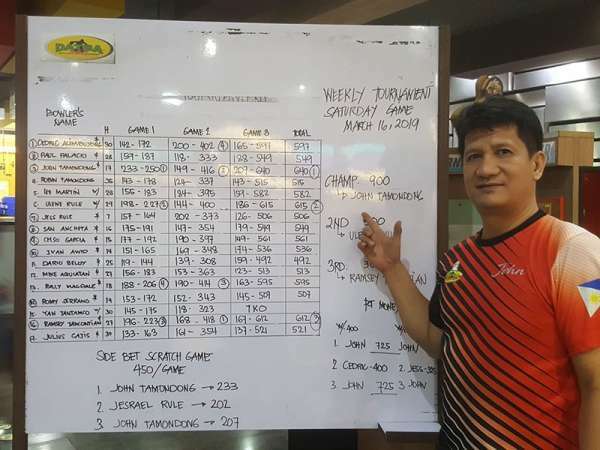 JOHN Tamondong hit a total of 640 pinfalls after three games to clinch the Datba weekly qualifying tournament title at the SM Lanang Premier Bowling Center over the weekend. Tamondong outclassed rivals Ulene Rule and Ramsey Tancontian who finished second and third, respectively. Rule struck for 615 pinfalls while Tancontian amassed 612 pinfalls in the Davao Tenpin Bowlers Association (Datba)-organized competition that serves as qualifying for the monthly finals. A total of 17 players vied for honors in the event. Rule received P500 while Tancontian claimed P300. Another qualifying tournament is set tonight.